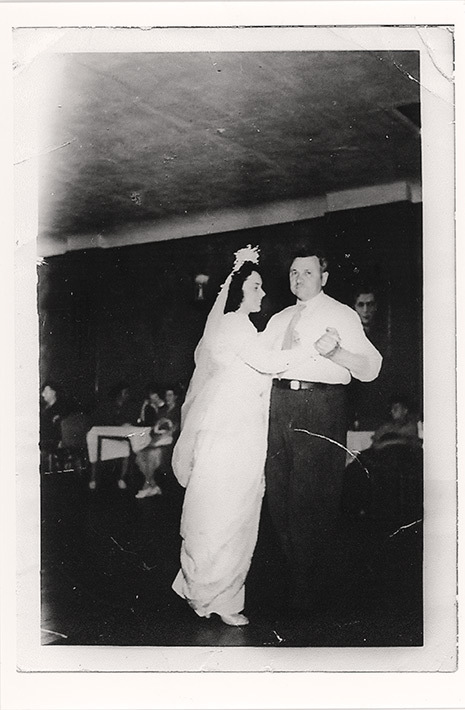 Black and white snapshot of Nida Olivieri dancing with her father, "Pop" - Antonio [Tony] Olivieri at her wedding in Hamilton, June 13,1942. Writing on the back of the photograph indicates that she is 20 years old when the photo was taken and that she was Antonio’s second daughter. The two are pictured sharing a father-daughter dance, alone on the dance floor as onlookers in the background are seated at banquet tables watching. Nida is pictured wearing a long, slender white wedding gown and veil, smiling away from the camera astride while her father, Antonio is facing the camera, wearing a white shirt, necktie and dress pants, pausing for a moment for the picture.